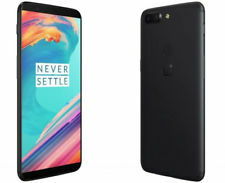 The OnePlus 5T is an impressive refinement of the company’s fast progression in smart phones. It’s very similar to the OnePlus 5, but the new screen size and face unlock feature make it feel surprisingly fresh. Unlike the OnePlus 3T, the 5T does not get a notable bump over the previous generation in terms of core specs. One plus 5T is a bit taller than the OnePlus 5 to accommodate the new screen, measuring 156x75x7.3mm. It won’t fit properly in an old case, but you wouldn’t want it to now that the fingerprint sensor is on the back. Luckily, it’s really fast, easy to use and is circular. The new OnePlus 5T is excellent with a huge, crisp screen and screaming performance. But it’s coming from a company that is dangerously close to annoying its fans and appearing like it has run out of ideas, even though it hasn’t. The display is altered with a 6.01in Optic A MOLED panel that uses a 1080×2160 resolution to create the 18:9 aspect ratio. It takes up a whopping 80.5 percent of the front of the device. It has a bright, colourful panel that is a smidge under Samsung-quality, but as is usually the case with OnePlus, it’s a belter of a screen, the auto-brightness setting is too aggressive and makes the screen too dim much of the time. The only changes are the display, fingerprint placement, camera sensors and new face unlock feature. It’s great that the 5T does not suffer from the jelly scroll effect that plagues the OnePlus 5 still. The display size and quality is the best upgrade here. One plus 5T has a quality camera set up. The main is 16Mp with f/1.7 aperture while the secondary is a 20Mp with f/1.7 aperture. This is an upgrade from the OnePlus 5, whose secondary camera was an f/2.6 telephoto lens. OnePlus claims the 5T is its best ever phone for low light photography and this appears to hold true. The battery life is about the same as the 5, and the 5T shares the same capacity. Dash Charge remains an excellent charging technology .5T achieve four hours of screen on time under fairly heavy usage until it was reaching empty. Call quality has been solid, and it’s good to see OnePlus plow on with the dual-SIM slot as standard, but there’s still no expandable storage. The one plus 5T is overall a better device .The 5T is the fastest phone we have ever used besides the Pixel 2 this year. Away from Android, this year’s iPhones are also ridiculously quick with Apple’s new A11 Bionic chip. One plus 5T comes with better viewing angles and lower power consumption, it can capture wonderful images without losing details even in low light conditions and it looks very premium in the hands. One plus 5T doesn’t not have expandable memory via card slot, its heavy to carry, it does not present FM Radio, it does not have JAVA. It does not have dust resistant. There is no waterproofing of any kind, nor any form of wireless charging. We don’t care about the latter too much, but the former is something the OnePlus 5T lacks in comparison to nearly every other Android flagship. So there are some sacrifices to achieve the price. It’s a phone we find to be ridiculously slippery. It’s so thin, and the back isn’t very grippy so snapping it into a case almost a must. This is a shame, as the cases do not show off the excellent premium build underneath. This isn’t a problem unique to OnePlus, though. It’s also definitely a two-handed phone. The lack of bezels looks lovely, but makes a phone harder to hold. Only the massive-handed will be able to reach their thumb to the top of the display, and for us texting with one hand is impossible.